Easter has always been one of my favorite celebrations growing up. My mom and my dad had very different ways of celebrating but both were special to me. My mom and I would go to the Easter Church service and have a ham dinner with my grandma. Where my dad would do an arguably over the top egg hunt for my sister and I full of eggs that contained money, candy, and even large eggs with saran wrapped video games attached to them! Easter was essentially a mini Christmas at my dad’s house. As I have grown older and started my own family I have decided to change some of the traditions I have grown up with. One of the things I enjoy about the holidays is that families each create their own traditions. When you add new people into your family whether by a new friend, boyfriend, girlfriend, husband, wife, life partner, child, or even fur babies traditions will change. No matter who you add to your family traditions are likely to change and grow into lasting new celebrations that bring everyone closer together. My son is 20 months old this Easter and since he is becoming more and more a toddler every day (help me!) I wanted to find some fun ways for our family to celebrate Easter together. Scouring through the internet has been a fun and exciting way to find great ideas that we can try. Every Easter morning has to start with breakfast. Whether you want to do something fancy or quick while the kids hunt for eggs in the yard there is nothing like a good holiday breakfast. A quick and easy idea my dad would always do for breakfast is Pillsbury cinnamon rolls. Now I know this seems like it isn’t all that special, but oddly enough I only eat cinnamon rolls on holiday mornings so it is something that starts the day off right. I found an adorable way to make cinnamon rolls more festive by shaping them into little bunnies! How adorable is that! Now I grew up with a tooooon of Easter candy, however now that I am a mom and my son is such a picky eater I try not to take up his tummy space with less nutritious items. Instead of filling plastic Easter eggs with little candies why not fill it with some “vouchers” for things to do. Things like “Trip to the zoo” “Stay up late” or maybe for older kids “Skip a chore”. 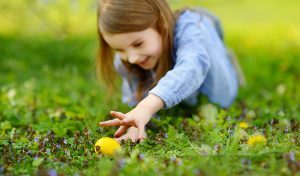 My son is too little to read, but I think that just finding brightly colored eggs with nothing inside will excite him. I am not trying to have my whole house covered in little miniature toys either so I love some of the alternative suggestions I have seen for Easter baskets. Some of my favorites are a new cup with their favorite character, a cute new pair of shoes, or maybe even a new book! 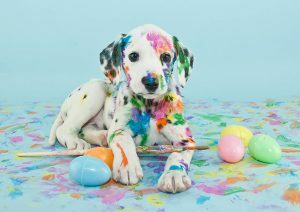 Kids don’t have to be the only ones to have some Easter fun. For the adults try minute to win it games. Even an egg hunt with adult beverages stashed inside of some eggs! There are all kinds of fun ways to bring a touch of elegance to egg decorating too! From these gorgeous Martha Stewart, decoupage eggs to cool tye dye techniques. 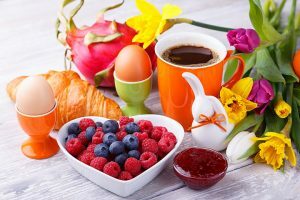 Source: Adobe Stock Honey ham on Easter table with eggs, flowers and decoration. 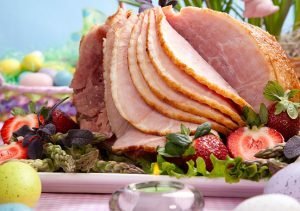 In my family, Easter dinner has traditionally been a delicious baked ham with all sorts of sides. Since it will just be my husband, son and I for Easter this year there is no way mama is making a ham! So I set out to find some alternatives (I love the internet). I haven’t decided yet, however, my husband has been perfecting a wonderful Beef Bourguignon recipe that I think would be a perfect Easter meal for our little family. Some other ideas I have found if you have a larger party are Easter bunny spinach dip, bourbon mustard glazed ham, and for dessert Easter egg fruit pizza!